"On April 20, 2015, we got word from the Fermi satellite and the MAGIC telescope observatory that they had spotted a very active source — one that was getting very bright in gamma rays," said Manel Errando, PhD, research scientist in physics in Arts & Sciences at Washington University in St. Louis. "We knew that this source emitted low-energy gamma rays, but this time we detected high energy ones that usually don't make it to Earth," Errando added. "This is the first puzzle: how is it possible that gamma rays of such high energies made the trip all the way from this very distant quasar to Earth without getting lost in the fog of visible photons in between? Errando is corresponding author on a paper about gamma ray observations of the flare that appeared in The Astrophysical Journal Letters Dec. 15, 2015. It is one of several simultaneous releases, he said. "Everyone who had a telescope was looking at PKS 1441+25, which was active across all wavelengths," Errando said. Very energetic gamma rays are easily knocked off by visible light, the light from galaxies and stars that fills intergalactic space, he said. Lower-energy gamma rays mainly interact with ultraviolet light and X-rays. There are lots of sources of visible photons — stars and galaxies — but not as many X-ray sources that would bother the lower-energy gamma rays. 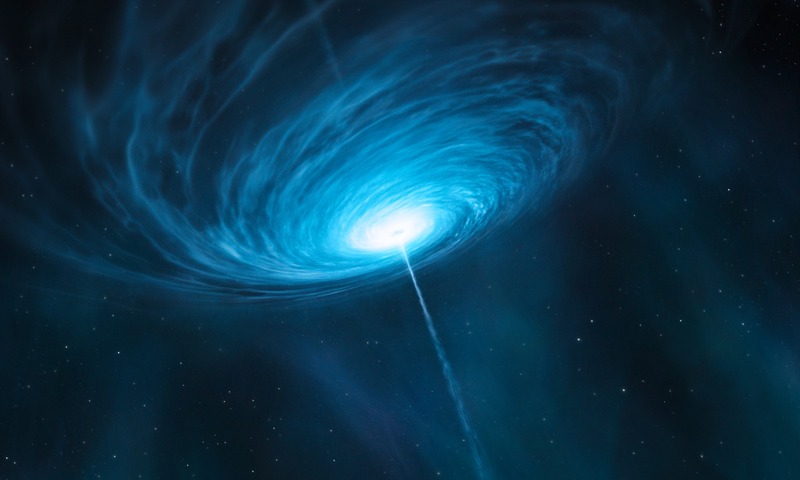 The arrival of high-energy gamma rays allowed the astronomers to set a limit on the density of the fog of photons between the quasar and Earth, the photons that should make it difficult for those gamma rays to propagate. While VERITAS was looking at the gamma ray emission from PKS 1441+25, the Owens Valley Radio Observatory in Bishop, Calif., was looking at its radio emission. "Whenever we see radio waves, we assume they are coming from far away from the black hole," Errando said. "If they are created in a very dense environment, they are immediately absorbed. Only when the density gets low enough are they able to propagate outward. So we knew that the radio emission was coming from far up the jet, quite far away from the black hole." "That surprised me," Errando said. "The central black hole is the most energetic element in this whole system, so you would expect these very- high-energy gamma rays to be produced close to it. Instead, they were emitted roughly four light years away, roughly the distance from Earth to the nearest star. "If the black hole were as big as a university classroom," he said, "the gamma rays would be emitted in Alaska. MIT: "An Interior Ocean May be Driving Geologic Activity on Pluto"